Are you an IT professional seeking a specialist qualification in information systems security? The Master of Information Systems Security from Charles Sturt University prepares you for the challenging task of identifying and producing solutions to threats that endanger information system resources. From the Graduate Certificate in Information Systems Security through to the master's program, Charles Sturt University has an option to suit you. The Master of Information Systems Security focuses on the design, implementation and management of secure computer networks and infrastructure. Preparation for the world's leading IT security industry certifications is an integral part of the course. You'll start by studying security policies and network security issues before selecting subjects that suit your personal interests, in areas such as digital forensics, cryptography, hacking countermeasures and the CISSP Common Body of Knowledge. Charles Sturt University's online delivery means you can study this degree from anywhere in the world. You can also fast-track completion by studying extra subjects in some sessions, slow down your study pace or even take temporary leave if you need to. The course incorporates preparation for industry certifications, including Certified Information Systems Security Professional (CISSP) from ISC2, Certified Ethical Hacker (CEH) and Certified Hacking Forensic Investigator (CHFI) from the EC Council, and Certified Incident Handler (GCIH) from GIAC. CSU also offers credit for a wide range of industry certifications from vendors such as ISC2, the EC Council and GIAC. The latest government higher education statistics show that CSU is Australia’s largest provider of postgraduate IT education. Join a diverse community of students and academics dedicated to addressing today's – and tomorrow's – cutting-edge IT topics. Your Master of Information Systems Security will position you at the heart of a rapidly growing global industry. You'll have career opportunities in areas such as digital forensics, network administration, security analysis and security engineering. For those wishing to further their expertise, this degree equips you with research skills that will prepare you for doctorate-level study, such as Charles Sturt University's Doctor of Information Technology. 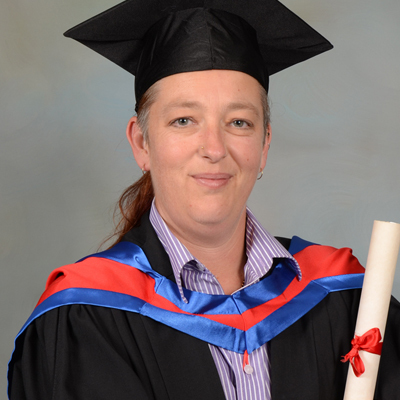 “The course I completed balanced academic study with relevant industry credentials and provided a great pathway for me to further my career in the IT industry. Once I got over the initial shock to the system of studying after such a long time away from formal education, achieving the work / life / study balance was the biggest challenge, but it is a skill you improve through the duration of the course. The quality, flexibility and accessibility of the online services for distance education students at CSU were excellent and there were plenty of opportunities to connect with others in the course."